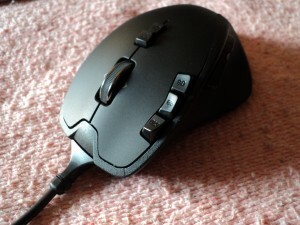 when I am using my G700 in wireless mode, but that’s just my old hardware conflicting with the new mouse… Anyway, keep reading for the full review! 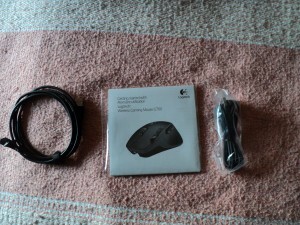 Logitech did a very good job with packaging this time. 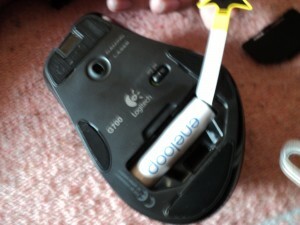 I was able to completely access the mouse and all of its components by just removing a piece of tape. 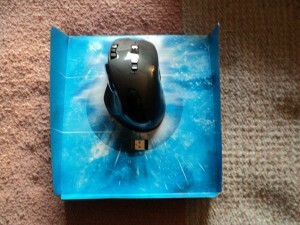 Then a cardboard inside slipped out containing the mouse, secured by a plastic tab. No need to hurt myself trying to get an annoying blister package open. 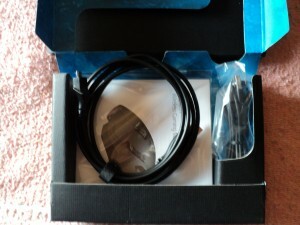 We all hate that… Inside the packaging was the mouse, wireless receiver, charging cable, receiver extender cable, and the user documentation. 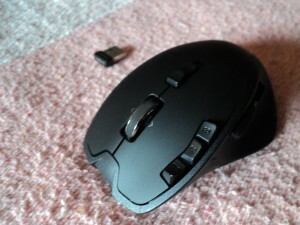 It is also worth pointing out that the mouse comes with a 3 year hardware warranty. Right off the bat I could tell this was a quality mouse. It felt like it was custom made for my hands. The buttons are positioned perfectly where they do not impact the use of the mouse at all. I also liked the fact that it uses a standard, low-drain, re-chargeable battery that I can replace down the line once it starts to fail to retain a charge. It also houses a slot under the battery cover to keep the wireless receiver which I though was nice, although very common. 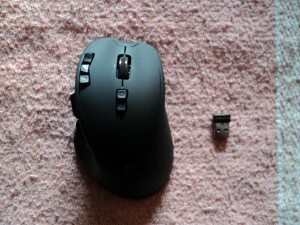 Since this is both a wireless and wired mouse interchangeably there are the basic components of each. 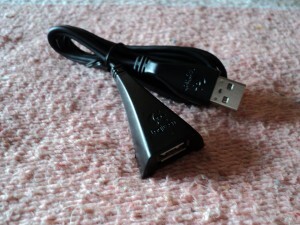 A wireless USB dongle for wireless mode along with an extension dock of needed. 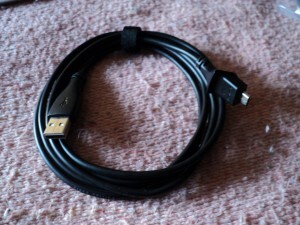 There is also a long USB cable that plugs into the mouse to charge it as well as use it in a wired mode. Although not necessary to use the mouse, it works right out of the box, it allows for more customization and adds some neat functions. Once connected with the Logitech Software you can set up as many profiles as you would like. These profiles are automatically switched to when the corresponding program is open. This allows you to have custom button layouts for each one of your programs and games. This takes the 13 programmable buttons and creates endless possibilities. Another cool thing was what the buttons could be bound to. You can basically make your mouse do anything. From mouse functions such as adjusting DPI with a push of a button to creating macros and repeating tedious keyboard tasks. It will even take note of delay in between keyboard stokes when recording the macro. It is quite a nice feature. 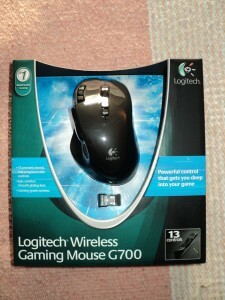 Another thing to note is that this Logitech Gaming Software can be used with a lot of other Logitech gaming equipment. This is nice so you don’t have to have a program installed for each device you use. No but really, it is indeed a very nice mouse. It’s a huge upgrade from my old EX100 wireless mouse. 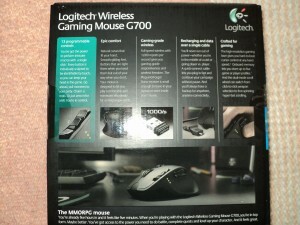 The G700 feels nice, has endless programming options, allows for me to decided whether I want to use a wire or go wireless, and more. This is truly one great mouse. If you have any questions, let me know in the comments! I’m happy to answer them. 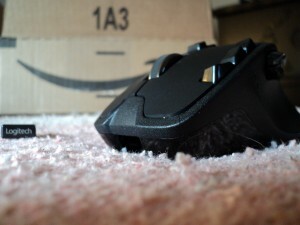 Also, if you already have an awesome mouse, let us know what you are using and what you love about it!